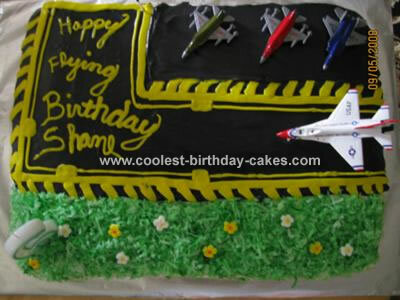 My son wanted an airplane cake for his 6 birthday. He specifically said he wanted a plane landing on the road made out of icing. So I baked a 11 x 15 cake. I put icing over the whole cake first then I took a toothpick to mark an air strip out with the large icing tip I piped out black icing for strip,then took Wilton large spatula dipped it in cup of water and then smoothed the icing out this also gave it a shine. I took coconut dyed green w/ food coloring for the grass then placed sugar flowers in it. My son was so proud of his cake. It was a big hit. I enjoyed making it. Are those real metal cast planes at the top? Or are they toppers?